I have 2...yes TWO layouts to share with you today! Between LOAD and CKC, I really have my scrappin' mojo goin' on. The first layout is about a trip we took to Nantucket long ago before we had children. I found these pictures as I was sorting a huge pile photos that had belonged to my parents. I've acquired many pictures since they've both passed now and I've been avoiding the task of sorting through them. As soon as I saw these photos, I immediately knew my "An American in Paris" kit would do them justice. I started working last night and finished up this morning. I'm glad I worked up the motivation, otherwise this layout may not have been "born". Hope you find some textiles to dress up your next scrapbook layout. Now, if you'll excuse me...I have sew much scrapping to do! Just a quick post to show you my latest. The LOAD prompt was 5-5-5...meaning spend no more than 5 minutes choosing photos, product or writing journaling. That's easy! I used my May Counterfeit Kit to make choosing papers and embellishments a snap. My go-to girl, Shimelle helped me out with a great starting point and I took it from there. I used the more boyish/graphic designs for this silly one about my hubby and son. Shimelle used a doily on top of the square piece of patterned paper but I swapped that out for a circular cut out of the solar system since I thought the lacey accent would seem out of place. Glad to get this one done early today. Might actually leave some time for another one! Scrapbook sketches are great. It's like a paint-by-numbers kit for a scrapper. But if you're like me, you like to change things up a bit and make it your own. It almost feels like cheating if you follow the sketch too much like the original. Sometimes I feel I can't get the original idea of the sketch out of my mind and then I can't break out of what it's "supposed" to look like. I'm also not sure if it's better or worse to see a finished example of the sketch. Then I sometimes get stuck on "having" to use striped paper here or a cluster of buttons there. As I am scrapping more and more and becoming more comfortable with my own style, this is becoming less of an issue, but it is still there. When I saw the sketch on the Counterfeit Kit Challenge blog, I felt pretty confident that I could pull something together. Here's the sketch and my take on it. I kept true to the overall layout, but did change things around a bit. I liked the squares with the rounded corners, but really only had 2 pictures that I wanted to use. I knew I wanted to stencil the word GO! and that needed to be on the background paper so it would be visible. So, scratch the title in the left hand corner. Add a border strip of banners across the bottom vs. on the top corner and I knew I HAD to include that "Enjoy the Ride" journaling sprout in the bottom corner. I fussy cut those butterflies from a piece of Jillibean Soup paper that I bought special to go in this month's kit (shhhh...don't tell! I've been trying not to make special purchases for my kits, but this one I couldn't pass up.) and thought they added excitement and movement...just like the mood of the event. And there you have it. Followed the sketch, but made it my own. Now it's your turn to try out this sketch...on your mark...get set...GO! Yesterday's LOAD prompt was to use the sense of smell as an inspiration for your layout. Smell is said to be the most powerful sense in that it can trigger so many memories. I find this to be so true, but yesterday was not a day I wanted to go far down memory lane. It was a hard day emotionally and I didn't want to venture in that direction...but that's a story for another day. Anyway, I decided to skip the smell prompt and use the hat inspiration from the Counterfeit Kit Challenge blog. 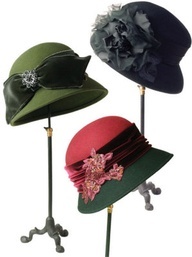 I studied the hats for a long time trying to find something to hang on to for inspiration. I decided that the burgundy and green hat reminded me of my Christmas wedding, so I rifled through my box of wedding photos and immediately came across a close up of my wedding bouquet. My new hubby and I are seeking refuge under the bouquet as we are being bombarded with rice...back when that practice was still in favor. Oh...those gardenias in my bouquet were so aromatic! Whenever I smell gardenias, it reminds me of that special day. This would make a perfect story for the LOAD prompt. Shift gears again and start to scrap my memory of those fragrant flowers. No gardenias or even white flowers in my stash, so off to YouTube to find a tutorial. http://www.youtube.com/watch?v=0HHyQnyIaOA Found one and fired up the cricut, got my spray bottle, and started scrunching petals. Some pearl brads, a heart punch for some leaves and Martha Stewart glitter completed the florals. This was my first attempt at ANY handmade flowers and in the end I was quite pleased. The addition of some tulle and pearls and a vintage journaling card set on some regal paper and my layout was complete. A quick post to show you my latest LOAD layout which was created from my May Counterfeit Kit. The prompt for "Tough Topic Tuesday" was to scrap about a conflict. The wooden frames and woodtone letters worked perfectly for this layout about furniture. And I'd like to think those tags are reminiscent of goods for sale at a Parisian market. What? Do you think I could stop him? Ugh! We quietly argued back and forth about the situation. I was tired and aggravated and went to bed. Well, Mother kept the curio and luckily it did grow on her. It fit nicely in the corner of the living room. It had a light that illuminated her treasures and she actually loved changing out her collections. From her dolls, to her Lenox birds, to her Willowtree Angels or just a mix of her favorites, she enjoyed having a show case. In the end, I’m glad she learned to love her curio. I just did not enjoy the process of her obtaining it. 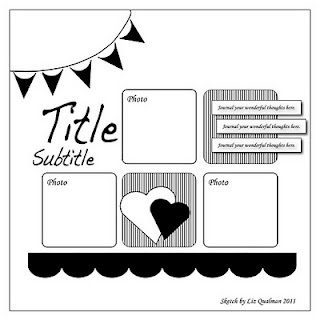 In today's LOAD prompt, Lain had us thinking about how we can convey the sense of touch into a scrapbook page. Connecting an image with something tactile came rather easily to me. I thought of this picture of my son and his beloved Teddy. Before locating the actual picture, I thought he was holding the bear, but once found I realized he was using it as a pillow. Either way, I still felt the picture evoked the sense of touch. The fluffy softness of the plush toy...soft enough to be used as his pillow. Then on to construct the layout. I knew I wanted to use the more graphic designs from my kit, along with the bike embellishments to tie into the transportation elements in his bedding. Shimelle, the master of combining pattern papers, assisted me in the layout with one of her starting points. The final touch was the ruler at the top which symbolizes my son growing up. I think he'll always have Teddy, but I'm not sure how much longer he'll be clenched under his arm or used as a pillow. I'm glad I'll always have this layout that shows their special little bond. Sweet (or as my scrappy pal Leslie says "sweat") Dreams! I love Layout A Day. I love Counterfeit Kit Challenge. Put them together and you get a fantastic way to easily create meaningful layouts with fresh patterns and designs. The prompt over at LOAD was to scrap a story from another person's perspective. If an infant could speak, I'm sure my daughter would have expressed her disapproval for the ribbon in her hair! As far as the layout, I used one of Shimelle Laine's starting points and easily chose papers and embellies from my "An American in Paris" kit. I love the way the fussy cut flowers turned out. They add just the right pop of color. I thought for sure I had saved that ribbon from my daughter's hair, but it could not be found in any of the obvious places. Instead, I used a similar piece of ribbon to frame out my journaling on the top. Voila! Layout complete. This month's Counterfeit Kit is based on the luscious Studio Calico's April Kit entitled, "City of Lights". Dainty florals coupled with bold graphics give this kit an interesting feel. This is my third kit I am counterfeiting since I hopped on board in March and I am loving the process. I find that I have such a great command of my stash since I am digging in every nook and cranny looking for possible matches for the kit. I combined the main kit with the add-ons and the result is this fantastic grouping of yumminess! I can't wait to start creating and maybe have a croissant, too! It seems there's a holiday or special day for everything. National Scrapbook Day. Who knew? This particular incidental holiday gets me excited, though. Scrapbooking has become an important part of my daily life. There was a time I only scrapbooked when I could get to an all-day or weekend crop and as you can imagine with 2 kids, that didn't happen very often. Then I discovered Layout A Day (LOAD), a month long scrapbooking challenge and things improved. I scrapped hot and heavy during these months (typically February, May and October), but as soon as the month ended, I fell back into my usual rut of non-creating. With the encouragement of my scrapper pal Leslie (you can check out her newly started blog at www.lcsmithsaved-outofthemire.blogspot.com) and a few added challenge blogs (counterfeitkitchallenge.blogspot.com and whimsicalmusingschallenge.blogspot.com), I am happy to report that I have been consistently scrapbooking since the end of LOAD February 2012. A monumental first for me. Scrapping just to scrap! So, while today is National Scrapbook Day and I am thrilled that someone declared a special day for the hobby I love, lately everyday has been Scrapbook Day for me and that's just the way I like it! In honor of the holiday, I visited my local scrapbook store that I recently discovered - Paper Anthology in Kenvil, New Jersey. Elisabeth, the owner, had several adorable and FREE make & takes and some special sale promotions in which I HAD to take advantage. Hey...local scrapbook stores are an endangered species! We all have to do our part ;-) Here are my creations, plus my layout for LOAD Day 5. An embossed and distressed tag, a stamped card, and a nifty little camera mini book were fun little make & takes at Paper Anthology. And here's my layout for LOAD Day 5 - Using an ebay search as inspiration. Today Lain challenged us to use our sense of hearing to capture a memory in addition to the visual of a photograph. I thought of several ideas immediately...one being my Dad's accordion music. His playing always made me happy and certainly brought him a tremendous amount of joy, but I didn't feel I had a specific story to tell just yet. Then I remembered how my Grandmother would always sing "Happy Birthday" with an added "da da da daaaaaaahhh!!" at the end. It was sung as if to say, "and many more". I envision a Vaudeville performer singing it while shaking his white hat above his head! What a picture that would be! Anyway, this was my Grandmother's version of the song and it is our tradition to sing this add-on after every birthday serenade. I thought I knew of the perfect picture, until I came across these of us actually singing to her on her 91st Birthday. I love that I have a picture of her singing her "da da da daaaahhhh" to herself as seen in the picture on the right. The rest of the layout came together quite easily with the jiffy background paper. Just a few embellishments, a journaling card and some baker's twine and it was complete. Story documented. This definitely could have been one of those traditions that future generations would say, "Why do we sing Happy Birthday that way?" Now they'll know. It's May and that means it's time for Layout A Day www.layoutaday.com. I hadn't intended on following today's prompt of using holiday colors in a non-holiday layout, but in the end, I think I did. Colors are rather Easter-y for a summertime layout, but it works for me. I've been thinking about starting a blog for some time now. My friend, Denine has had a blog www.thebicycle-chef.com for years and I always enjoy seeing her stunning culinary delights and reading about her dedication to fitness and cycling. She takes great care in developing original recipes, preparing them, photographing the process and then blogging about the results. I am always in awe of the level of detail, the links, and the consistency in which she posts. After perusing my scrapbooks this past summer, she encouraged me to start a blog, but I always seem to come up with a million reasons why I can't. Time being the main reason. Well, I really don't have a lot of extra time, but I do enjoy spending time on the computer. So, rather than aimlessly wandering around the internet (not that I still won't do that a little bit! ), I'm going to document my scrapbooking journey. At this point, I'm not sure if it will just be a gallery of what I'm working on or perhaps, at some point, a resource for how-to scrapbook techniques. So, this is where it begins. Not sure where I'm going, but I can guarantee it will be full of scrappy fun.